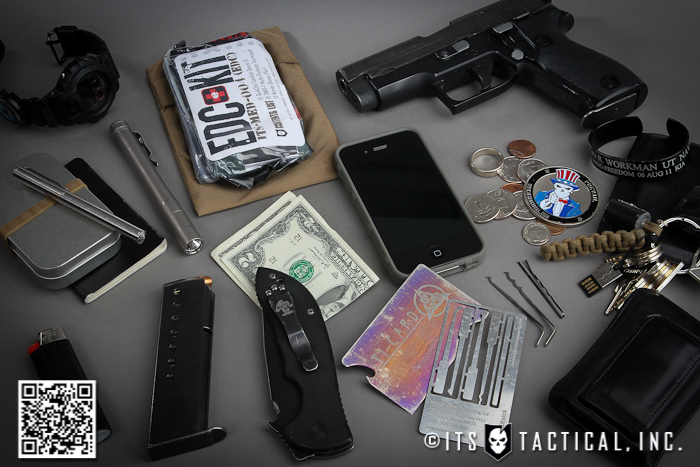 Here is the last of a five part series concerning every day carry kits and how we might use a structured decision-making process to put them together. The first part of this series introduced the idea of deliberate and structured planning for reasonably foreseeable contingencies. The second installment focused on conducting a security threat assessment (in the form of a limited example), so we’d have a basis for making decisions about what to carry. The third offering expanded on the example by discussing planned responses in light of the threats previously identified. The fourth article in the series took the limited example a step farther by suggesting tools, resources and supplies needed in order to implement the planned responses. 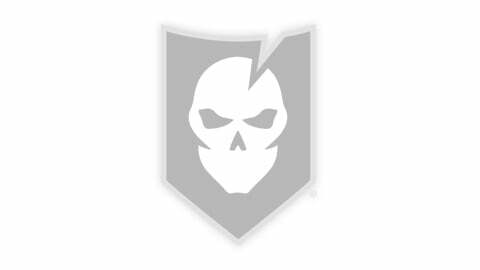 As we’ve seen in some of the comments, EDC is something different for everyone since the threats we perceive, and how we choose to respond to them will be different based on our particular situation, knowledge, training and personal preference. Now, it’s time to speak to assembling kits. Using the items from the limited example constructed in the previous articles, I’d like to show how our every day carry kits can be kept in different locations, and how they can take different forms. Sometimes it’s as simple as putting items in your pocket, and other times we’ll need a bag, box, shelf or container of some sort to help us keep our necessities close at hand when we need them. The analysis undertaken in the previous articles was deliberately scaled down so as to be manageable from a standpoint of providing an example. With this in mind, you’ll understand why some of the kits discussed below might seem sparse in terms of content. The analysis was also organized by scenarios in specific locations, so the results are conveniently organized that way as well. 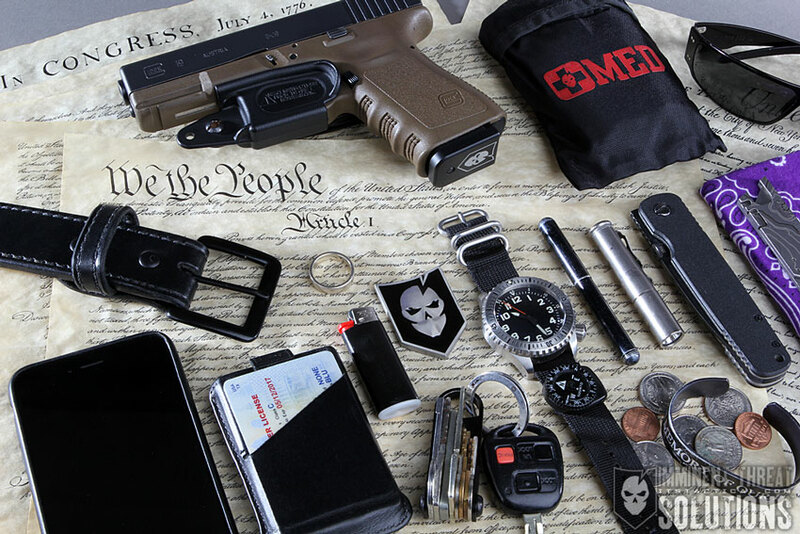 My example everyday carry kit for on my person included cash, credit card, coach style whistle, cell phone, small frame revolver, and a little extra ammunition. All of these items easily and comfortably fit in the pockets of my pants and around my neck. Most often, the revolver is held in place by my waistband, although I sometimes use a holster for that. Cash and credit card are held in my left pocket which obviates carrying a wallet. Extra ammunition is in my right pocket so (as a right-handed shooter) I can hold the revolver in my left hand and comfortably reload with my right. The cell phone can be carried in a pants or shirt pocket, or clipped to my waistband. In this limited example, with the exception of the cell phone, it’s clear that no special bags, pouches or carriers are necessary to maintain what I consider essential on my person. With respect to an EDC kit in a vehicle, the results of my limited example distinguished between items necessary year round and those required only during the winter season. Year round vehicle carry included cell phone charger, a note with contact names and numbers, a local phone directory, a three day supply of medication, pen and small note pad, tow rope/strap with open hooks, pocket knife, a “space blanket,” two books, and three small wire puzzles for diversion/entertainment. All of these items can easily be stored in the console, glove box, and under the seats of my compact car, thus consuming no space in the passenger compartment or trunk. As currently envisioned, the kit does not interfere with normal use of the vehicle. The tow rope/strap with hooks can be nestled around the spare tire in its well, and therefore is also not a consumer of space inside the vehicle. For the winter months, the number of items in the vehicle increases substantially to address concerns associated with both local and cross country travel. Nevertheless, all of these items consume less than 20% of the space in my small trunk, and therefore aren’t burdensome to store/carry. Items for winter weather included mittens, gloves, neck fleece, head band, wool socks, sweat pants, jacket, sleeping bag, small snow shovel, strap-on traction devices, traction sand, and two pieces of carpet and two short wood planks with grating fastened to them for traction assistance. Most of the winter garment items are easy to stow in a net bag, so loading and unloading for winter weather is rather easy. I just include them as part of my packing routine, as they’re really only necessary when I take a long trip in the winter where being stranded in the middle of nowhere during a blizzard is a possibility. Some of the larger items are thin and lay flat so they don’t necessarily take up much space. During the summer, they lean against a wall in the garage. To address threats not encompassed in the limited example analysis, it’s likely that my vehicle kit would also contain tire repair tools and supplies, a 12 volt compressor, reflective warning devices, a flashlight, and a small set of tools. Many of these items could occupy the well that the spare tire sits in. Others could easily be stowed in small recesses in the trunk, thus allowing full use of the trunk (except in the winter when additional supplies are present there). Although not usually thought of as a place for “carry,” I included threats at home in the limited example analysis. It’s clear to me that the structured decision-making suggested in this series can be used effectively to create kits at home, whether you’re electing to survive in place or bug out. The results of the limited study (winter power outage scenario) suggests that my at-home kit should contain several means of starting fires (matches, lighter, fire starter), a one week supply of kindling and firewood, a week’s worth of candles with candle holders, 15 gallons of gasoline in containers with pouring spouts, starter fluid, and a generator-to-well electrical hookup to power my water supply with a 5kW generator. Again, I’m finding that keeping these resources on hand isn’t inconvenient in the least. The firewood and kindling are easily stored near the kitchen wood stove in a designated area for wood. Matches and lighter are kept in a small box nearby. Fire starter resides in a small bucket next to the wood pile. Candles and holders are kept in a drawer. The generator-to-well hook up cable is mounted on the portable generator, as is a can of starting fluid, and it’s all tucked away in the garage. It’s clear to me that when it comes to bug out kits, a satchel will be necessary, and when it comes to food and water storage, a dedicated place in the basement with shelves and containers will be required for organization and preservation. If we’ve organized our structured thought process according to location, the results of our analysis should naturally lend itself to identifying proper location for our gear and supplies. For example, if a threat is associated with an incident on the road, then it makes perfect sense to consider your vehicle as the proper place to keep your emergency gear. If one of your threat scenarios is making it back home from your work location, then perhaps a kit at the office or in your locker at work would make good sense as well. Thinking in this way can eliminate the need to carry all of the items on your person that you might need at work or while on travel. Bulky or less easily carried items can be placed in locations that are convenient, and when combined with what we carry, a full complement of items can be readily available to us in the form of tools, resources and supplies. For response to threats that might occur in more than one location, you might consider duplicate resources, if they’re not bulky or expensive. Having drinking water in your vehicle, at home and at work seems like a reasonable thing to do, instead of carrying it around with you. Or, you might consider simply keeping tools, resources and supplies, for multi-location scenarios, on your person if they’re not too heavy or bulky to carry. Such might be the case with a firearm, cell phone, EpiPen or medication. You might need them at work, on the road, at home or while doing business, but keeping them on your person makes the most sense since it allows you to have them readily available in nearly any situation/location. The main point I’d like to make it that carrying things on your person can make sense, but it can also make sense to have storage locations elsewhere – every day carry doesn’t necessarily mean you have to carry everything with you – for some items, it’s more important to have them readily available as opposed to immediately available. Cars parked outside in the summer get hot all the while you stay comfortable in the office. Backpacks carried in the winter freeze while you stay warm in your jacket. Items carried next to your person can be exposed to wear, impact, and high moisture (even in a dry environment). Improperly sealed or preserved supplies are susceptible to mold, mildew, insects, rodents and oxidation. To guard against such degradation, we need to think through our carry and storage scenarios over a long time horizon and imagine the factors that they can be exposed to. We might need to get inventive when it comes to sealing and preservation techniques. Also, we need to consider access that others might have to our stash of stuff – children, co-workers, guests, visitors, thieves, vandals, etc. So, good storage conditions and secure/secret storage conditions should be considered. Replacing water stores with fresh water. Rotating through newer medications to reduce the influence of environment and age. Prescription medicines change, so should the backups in your kit. Job location or travel requirements have changed. Family or life changes occur – a new born, a live-in, or the onset of physical impairments. The content of your kit is burdensome, and you suspect you went “overboard” with your analysis. You used to drive yourself, now you carpool. You get the idea. Sit down with your analysis to verify that threats are still valid, planned responses are still appropriate, and the tools and resources you anticipated would be needed are indeed still necessary. Also, update items that are susceptible to wear, degradation, damage and contamination. It makes sense to me if you’re going to go to the trouble of creating an every day carry kit, that you also go to the trouble of making certain that it continues to meet your needs. 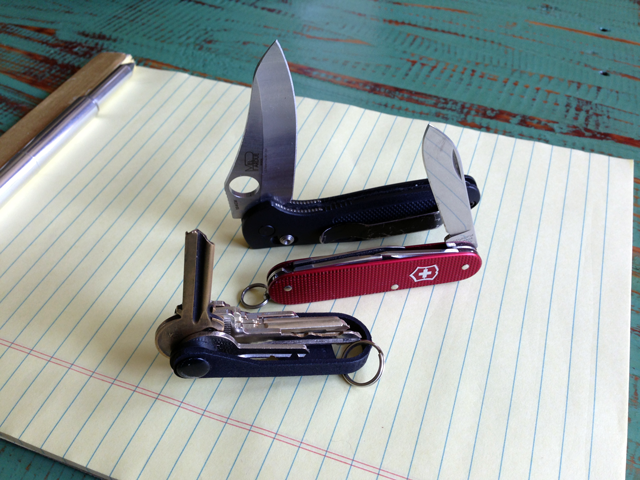 I’ve enjoyed preparing this series of articles about how one might use a structured decision logic to create every day carry kits. Being a bit of an analytical person, yet having an eye toward frugality, I think it’s important that we take the time to identify reasonable threats and plan thoughtful responses. It seems to be a good way of being better prepared. The beauty of this approach is that everything is tempered by the individual performing the analysis, so the outcome is truly customizable. If you think nothing serious will ever happen, then your analysis will lead you to carry very little if anything to be prepared. On the other hand, if you feel the need to be prepared for nearly every conceivable contingency, and you don’t want to leave anything to chance, well, you’re going to need someone to help you carry all that stuff. In any event, good luck with your own analysis. I think it’s a good first step in being prepared to take care of you and yours. Clair Schwan hosts Self-Reliance-Works.com, a place where they understand that satisfaction and happiness come from self directed achievement. He also hosts Frugal-Living-Freedom.com where the motto is, “living well, and well within your means,” and there are plenty of examples that show you how. His personal slant on things comes from a propensity to be analytical, self-directed, prepared, and watchful with respect to return on investment.